5 Bdrm Detached Dwellhouse. Ground flr: V/bule. Hall. Lounge. Bdrm. Dining rm/Bdrm. Bathrm. Kitch/Family rm/Dining rm. Sun lounge. Utility rm. Mezz flr: Bdrm with ensuite. 1st flr: 2 Bdrms. Study/Boxrm. Workshop (CT band - E). Garden. Parking. 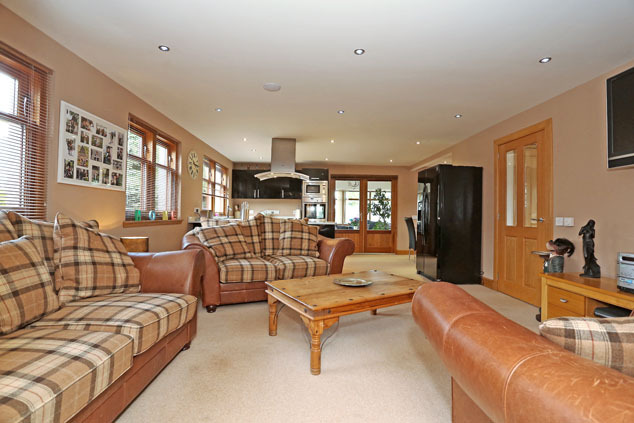 Price around £380,000 Entry by arr. Viewing 07795 601030 or contact solicitors. Below Home Report Valuation (EPC band - D). 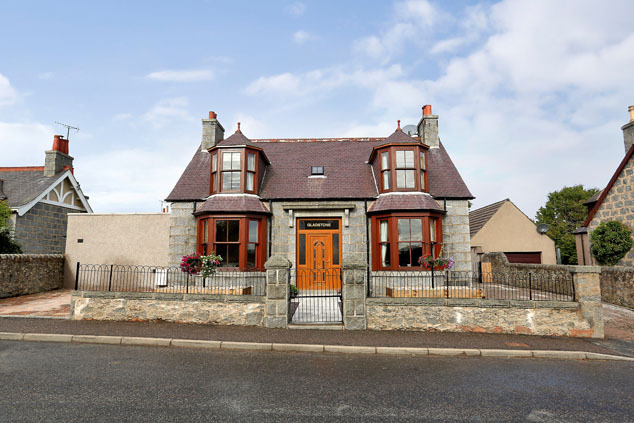 We are delighted to be marketing this traditional granite fronted four/five bedroomed detached dwelling with sun lounge, workshop and landscaped gardens, which has been tastefully upgraded and extended, as well as retaining many fine original features. 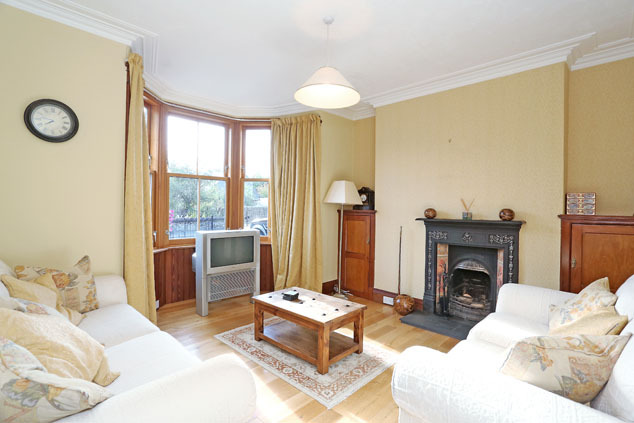 The accommodation forms a spacious family home to include the vestibule with wood linings and lovely hallway with access to the lounge and dining room, each with fabulous bay windows and original fireplaces. 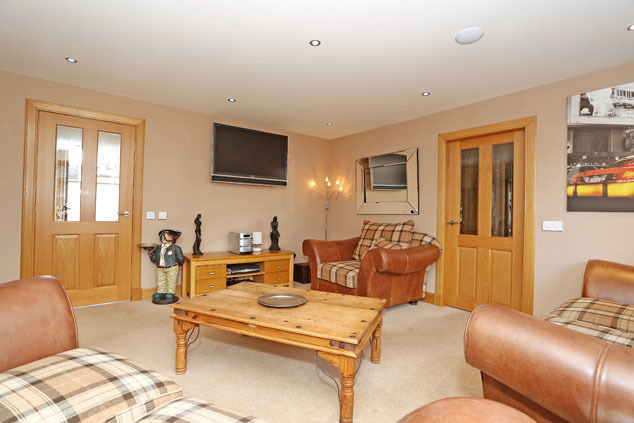 There is also a double bedroom and recent extension with underfloor heating throughout including the bathroom with separate shower, the kitchen/family/dining room, south facing sun lounge overlooking the gardens and utility room. 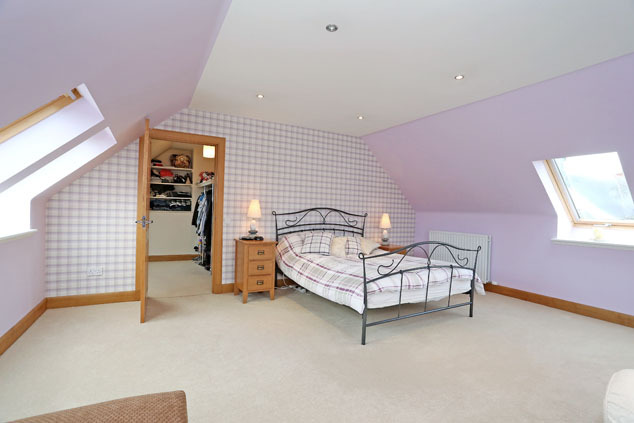 The mezzanine floor includes the stylish master bedroom with en suite and dressing room. 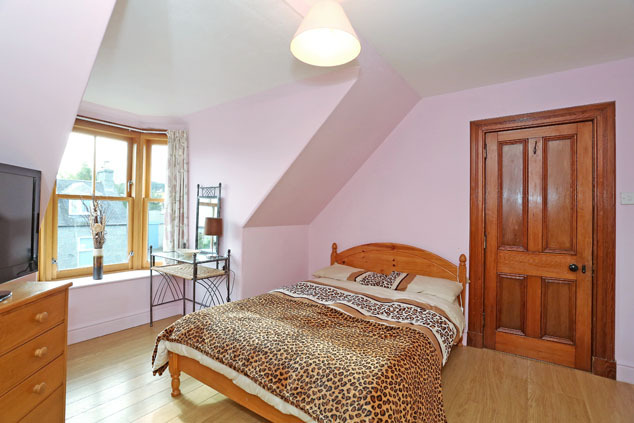 The first floor includes two double bedrooms, one with a study off, and box room. 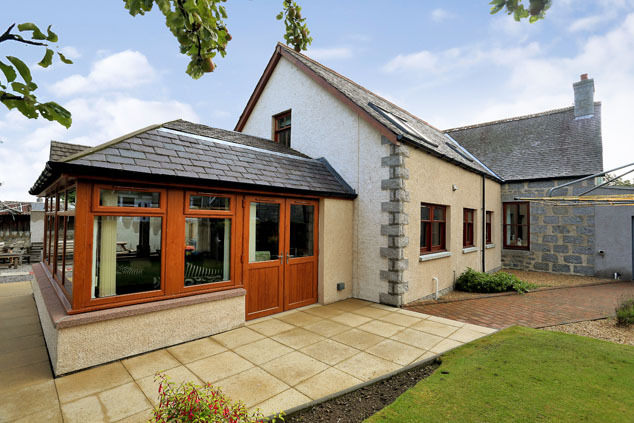 Outside, there is a workshop and beautiful south facing gardens with large lawn, flower beds and summer house which is included. Viewing highly recommended. Alford is a thriving village enjoying a host of excellent amenities with primary and secondary schooling and a new Community Campus to open soon providing a new nursery, new primary school, academy, swimming pool and community library. Additional recreation activities include a golf course, tennis, bowling, a dry ski slope and the Haughton Country Park. 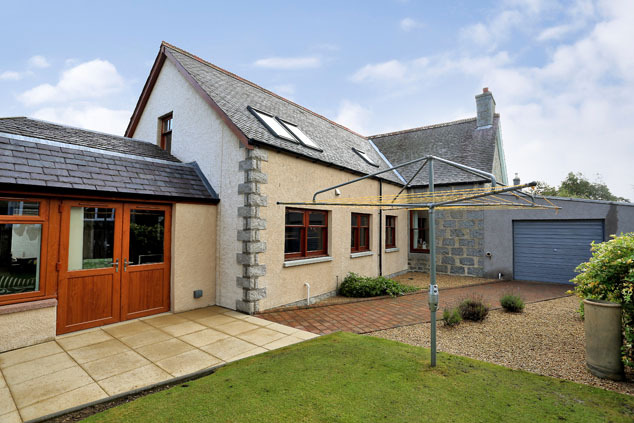 The village maintains a good range of shops, banks, hotels, a library and health centre and is well placed for access to the Lecht ski resort as well as being within easy commuting distance of Westhill, Aberdeen, Dyce and Inverurie. Vestibule 6’5” x 5’8” [1.97m x 1.74m] approx. Retaining many fine features including the original wood panelling, ceiling cornice and rose, there is a glazed name plate above the uPVC part glazed front door. The vestibule also includes the wide part glazed door with side lights to the hallway and attractive vinyl flooring. Hallway 11’4” [3.46m] approx. 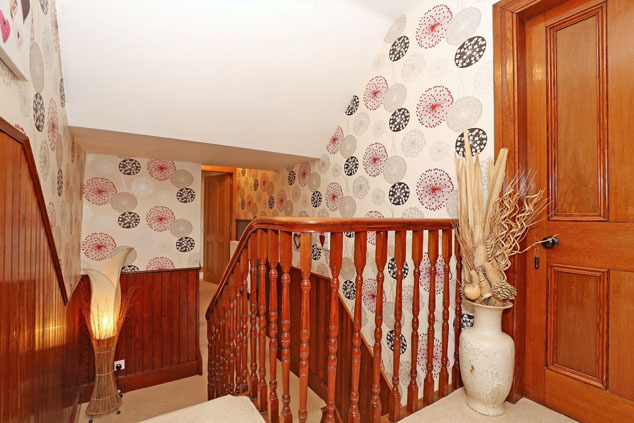 length With attractive solid wood flooring and retaining all the natural wood finishings, panelled doors and linings, the hallway gives access to the lounge, dinning room, double bedroom, rear hallway and stairs to the mezzanine and first floor. Lounge 14’4” x 12’6” [4.36m x 3.81m] approx. With the feature hardwood wide bay window to the front, dressed with attractive drapes, filling the room with natural light, the lounge also includes solid wood flooring, ceiling cornice, cast iron fireplace with Victorian style tiles, real fire, slate hearth and two built-in store cupboards at each side. TV point. Double Bedroom 4 12’9” x 8’10” [3.89m x 2.69m] approx. 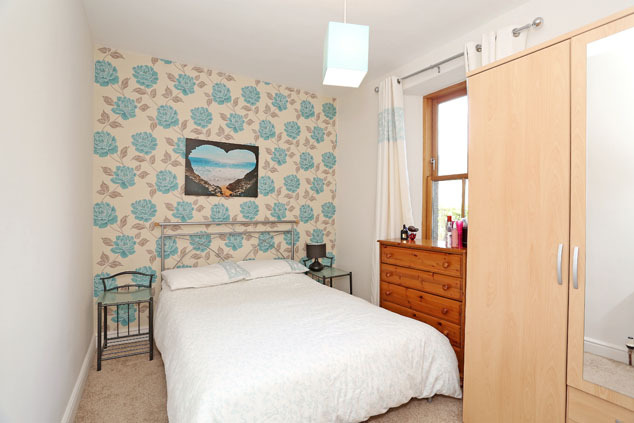 This attractive double bedroom overlooks the landscaped rear garden through a large studio window. TV point. Dining Room/Bedroom 5 14’2” x 11’6” [4.34m x 3.51m] approx. 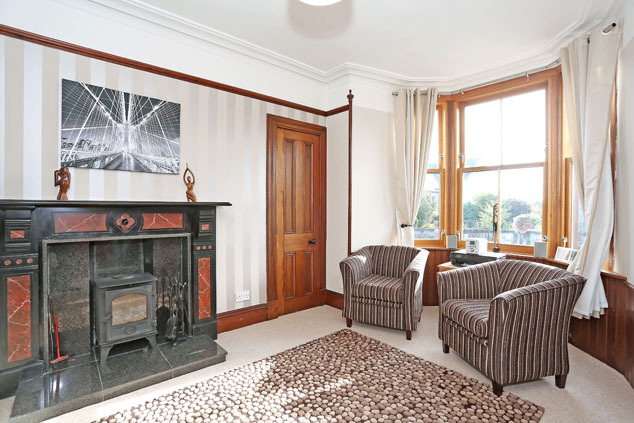 Almost a mirror image of the lounge, with the lovely wide bay window, this versatile room, with feature decorative wall and built-in shelved cupboard, also includes an original art deco style fireplace with multi-fuel stove on the polished granite hearth. Picture rail, ceiling cornice and rose. TV point. Rear Hallway A half glazed door from the hall leads into the recent addition within the extension, the rear hall which gives access to the kitchen/family/dining and the family bathroom with separate shower. Shelved storage cupboard. Family Bathroom 11’2” x 8’5” [3.40m x 2.59m] approx. 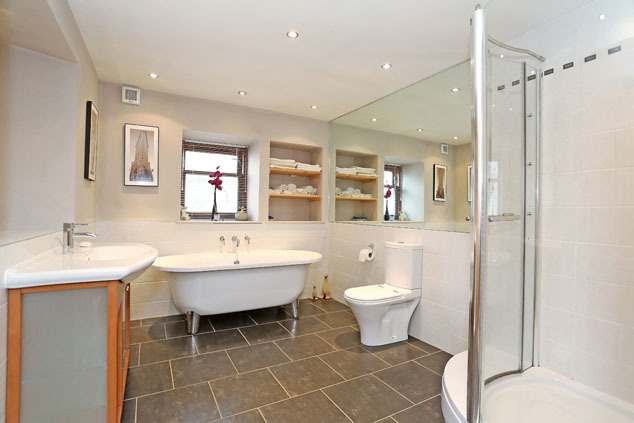 This elegant and extremely stylish bathroom, with luxurious underfloor heating below the Italian floor tiles, includes attractive wall tiling and the white suite with a wide wash hand wash basin set on a frosted glass vanity storage unit with recess and fixed mirror above. The w.c. includes a large wall to wall fixed mirror above. The fabulous roll top bath is below the deep silled window with a recessed shelved area adjacent and the large shower cubicle is opposite with twin shower heads and the chrome ladder heated towel rail adjacent. Downlighters. Kitchen/Family/Dining Room 25’1” x 22’5” > 14’10” [7.66m x 6.83m > 4.54m] approx. 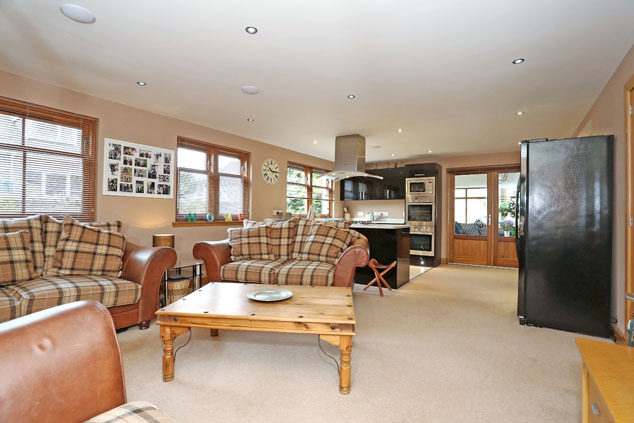 This recently added, attractively presented space, on open plan, is a family favourite and includes the family room with wall mounted TV and two windows dressed with blinds. The luxury fitted kitchen, with granite work surfaces and Franke 1.5 porcelain sink and Gesse tap, also has a window filling the area with morning sunshine. 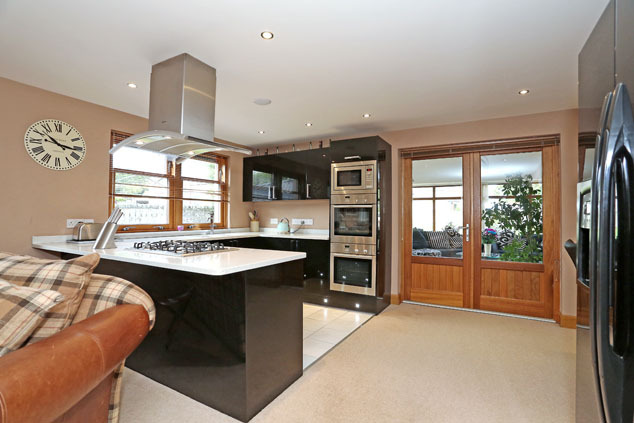 The five ring Neff gas hob, stainless steel hood, wall mounted double ovens, combi microwave and dishwasher are included. The American style fridge/freezer is available separately. 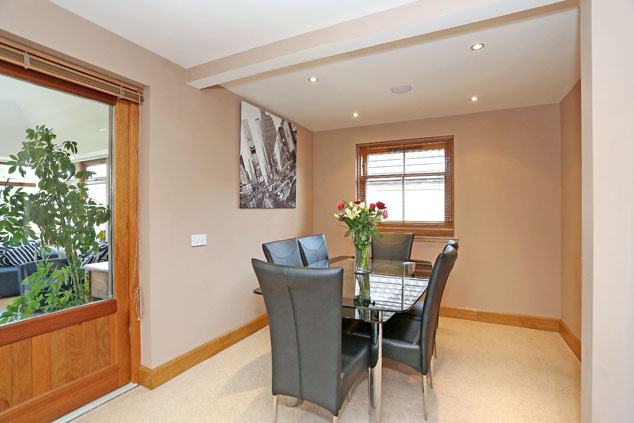 The dining area, with a west facing window, provides space for a table and chairs. Downlighters. TV, telephone and Sky connections. Sun Lounge 15’11” x 15’0” [4.87m x 4.58m] approx. Half glazed French doors lead to this fabulous south facing sun lounge with deep silled windows on three sides dressed with vertical blinds. With lovely vaulted ceiling, French doors open out onto the paved patio. 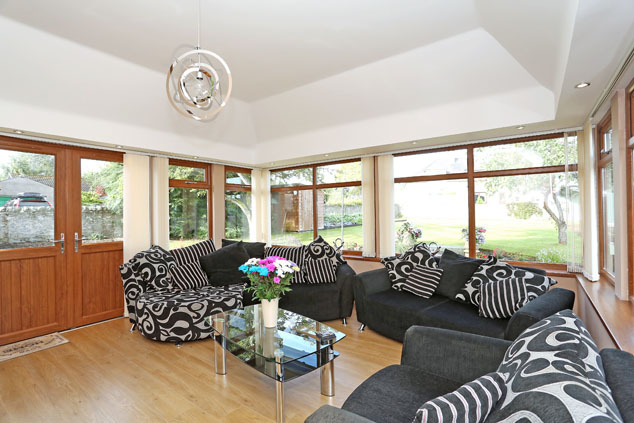 The attractive wood effect flooring has underfloor below heating. LED downlighters over the deep silled windows. TV point. Utility Room 12’4” x 6’7” [3.77m x 2.02m] approx. 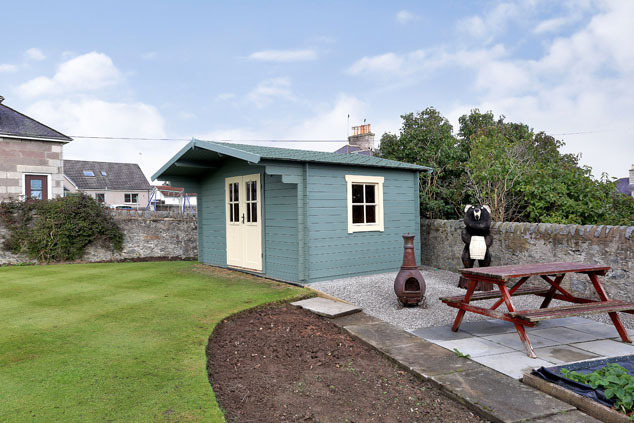 This handy space with half glazed door to the side garden includes a double door storage cupboard containing the underfloor heating manifolds, the hot water tank and fuse box. The stainless steel sink is below a west facing window and is contained in the L-shaped work surfaces which have units at high and low level, providing space for a washing machine. Flagstone style flooring. Mezzanine Master Bedroom Suite 25’0” x 17’11” [7.64m x 5.47m] approx. 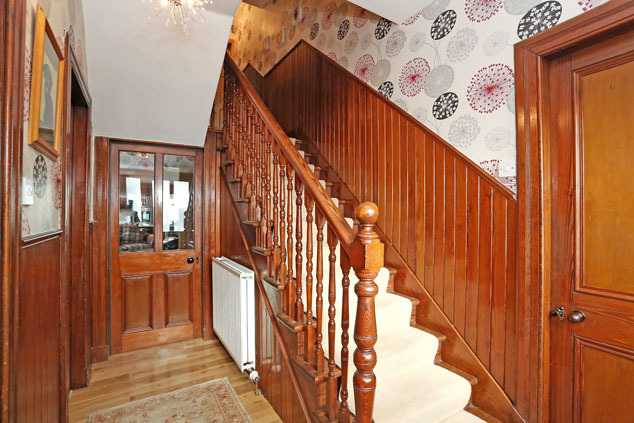 The wooden staircase, with neutral carpeting and wood linings to dado height, leads to the master bedroom suite with a further staircase leading to the two double bedrooms and box room on the first floor. This recent addition, with cream carpeting, includes the dressing room with hanging and shelving space. 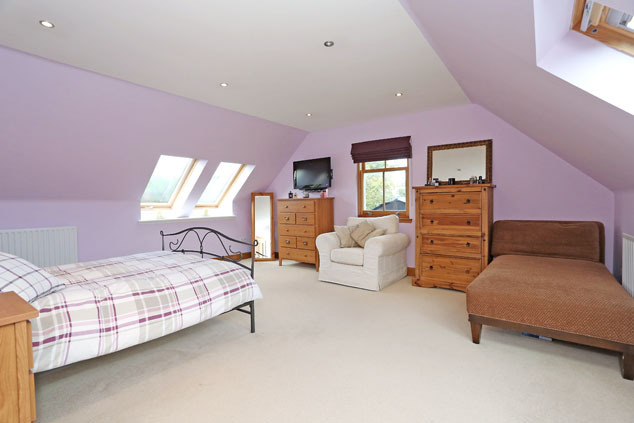 The extremely spacious double bedroom with twin east and west facing velux windows in the combed ceiling has a south facing gable end window overlooking the landscaped gardens. Wall mounted fitments for a TV. Telephone point. 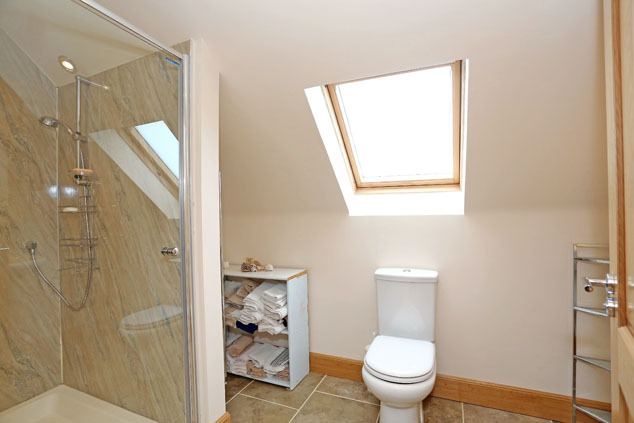 The En Suite, also with underfloor heating, includes Italian floor tiling and a white hand wash basin, w.c. below the velux window and extra large shower cubicle with wet wall and twin mains shower heads. Chrome ladder heated towel rail. Extractor fan. Bedroom 2 13’6” x 11’6” [4.12m x 3.52m] approx. 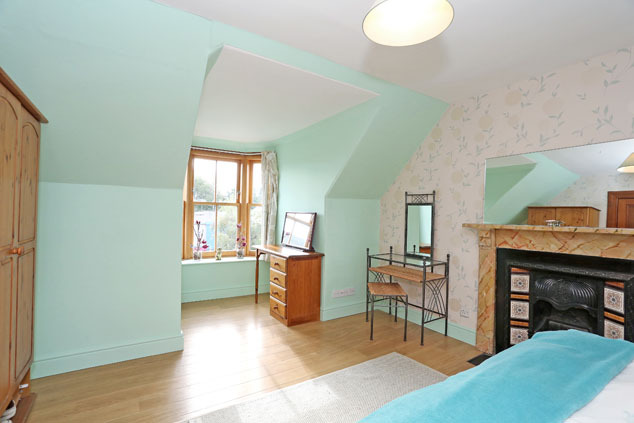 Located on the first floor and filled with morning sun through the deep silled bay window, this attractive double bedroom, with original feature Victorian style fireplace and solid wood finishings, has a walk-in wardrobe (11’8” x 6’5” [3.57m x 1.97] approx.) off which could be a study or box room and is fitted with a velux and carpeting. Bedroom 3 18’6” x 12’8” [5.66m x 3.86] approx. 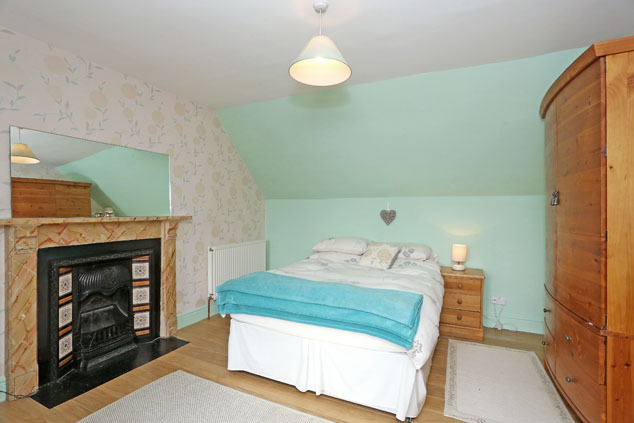 With the original fireplace intact and the recessed east facing bay window, this attractive double bedroom also has oak flooring. Study/Box Room 6’8” x 6’5” [2.05m x 1.96m] approx. This bright room is presently used as an office. Telephone point. Workshop 22’7” x 13’1” [6.88m x 4.00m] approx. Located to the rear with its own heritage block driveway, this workshop could be open to the front with appropriate permissions. 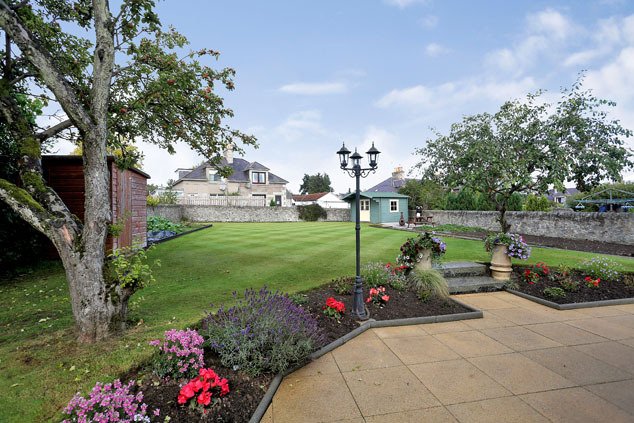 Gardens The property is situated on an extremely large plot. The low maintenance front garden laid to gravel with raised ornamental gravel beds and hanging baskets. A gate and gravel drive lead to the side area which has the half glazed door to the utility room. 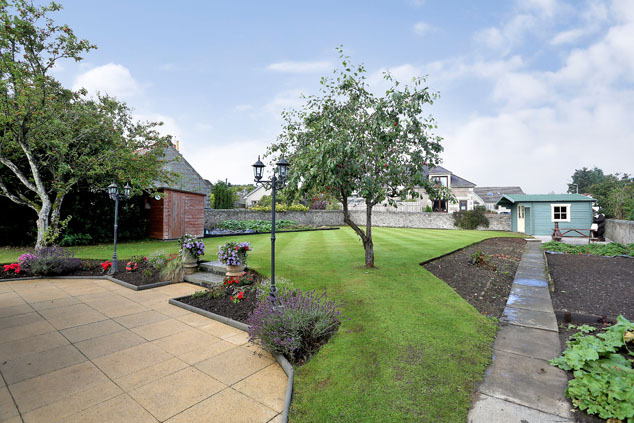 A further gate leads to the enclosed south facing rear garden which includes a large lawn, vegetable and fruit plots, paved pathways, plum and apple trees and has a large gravelled patio and barbecue area. The large summer house at the bottom of the garden is included. External lighting, water tap and electric socket. Directions Following the A944 to Alford, carry along the main street and turn left into Kingsford Road. Gladstone is the fourth house on the right hand side. Notes Oil fired central heating with underfloor heating on the recent extension. Double glazing. EPC=D. 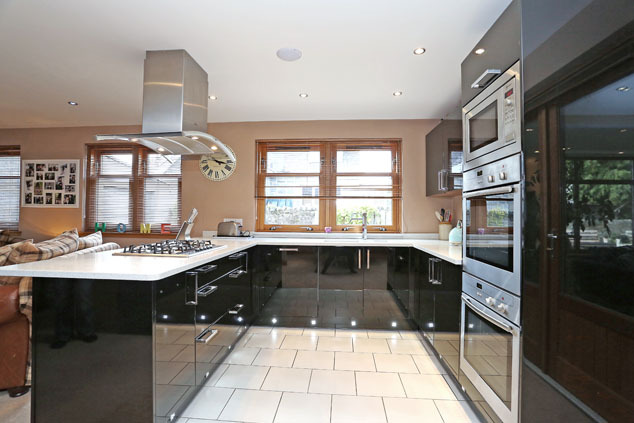 All light carpeting, drapes, blinds, light fittings, the five ring gas hob, stainless steel hood, double ovens, combi microwave and dishwasher are included. The summer house is also included. The American style fridge/freezer is available separately.